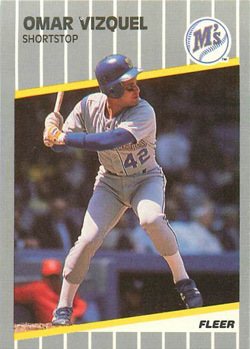 Omar Vizquel (1989) age 43. Chicago White Sox. Jim Thome (1991) age 40. Minnesota Twins. Ivan Rodriguez (1991) age 39. Washington Nationals. Arthur Rhodes (1991) age 41. Texas Rangers. I think the four of them should get together and talk about how great baseball cards were in the late 80s and early 90s. Jamie Moyer debuted in 1986. He is 48. In 2010, he played for the Philadelphia Phillies. He hurt his arm in November 2010 playing winter ball. Technically he is a free agent. He had surgery in December 2010 to repair the ulnar collateral ligament in his elbow. He is not ruling out playing in 2012. Wait a minute. The only active MLB players from the 90s all started in 1991? There are no active MLB players that started in, say, 1999? whoops. Thanks for catching that error, Spudart. The post is now corrected.